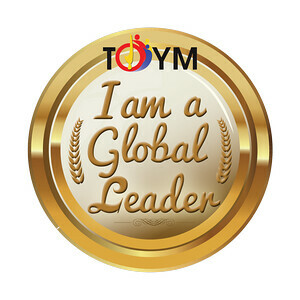 Hello from Barcelona! We finally arrived this morning after a five-hour early morning bus trip from Valencia. After settling down, lunch and a short siesta, it was time to explore this cosmopolitan Spanish city. And the best place to start is by walking along La Rambla and exploring Barri Gòtic! 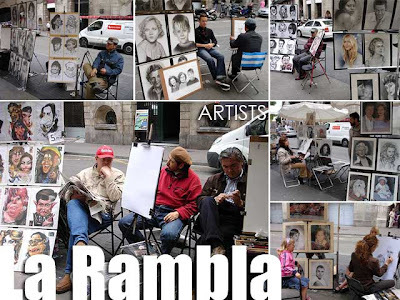 An iconic and busy central street of Barcelona, La Rambla (also called Las Ramblas or Les Rambles) is a 1.2 kilometer tree-lined pedestrian mall. And it sure had character! I enjoyed watching the many street performers in colorful and creative costumes, the various souvenir stalls, pet shops (which sold turtles), flower stands and the artists' makeshift studios among many others. And there were just so many people! 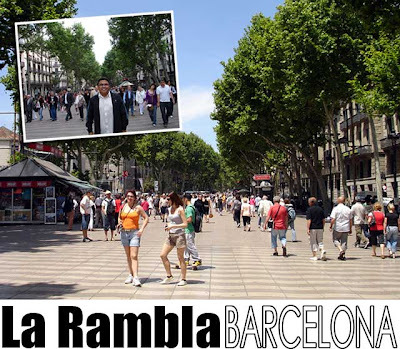 Rambla in Catalan, as well as in Spanish, means an intermittent water flow, derived from the Arabic ramla which means 'sandy riverbed.' 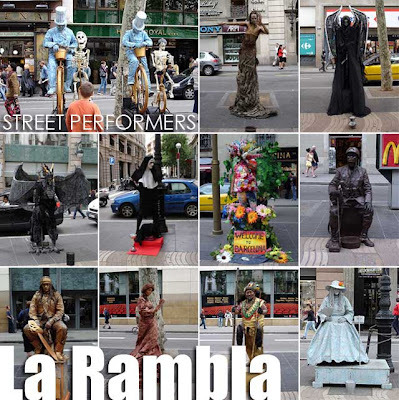 It was a very charming street and I very much agree with Spanish poet Federico García Lorca when he said that La Rambla was "the only street in the world which I wish would never end." 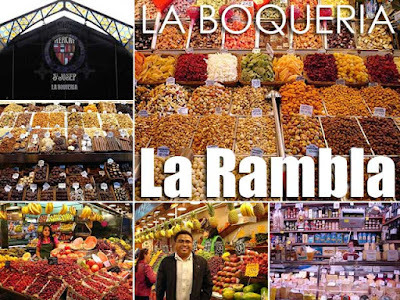 Along La Rambla is the entrance to another iconic attraction of the city, a street market called the Mercat de la Boqueria. I enjoyed the many tastes, colors, and scents inside the market, indeed a feast for the senses with its diverse selection of goods. I tried out the chocolates and candies as well as the fresh fruits. 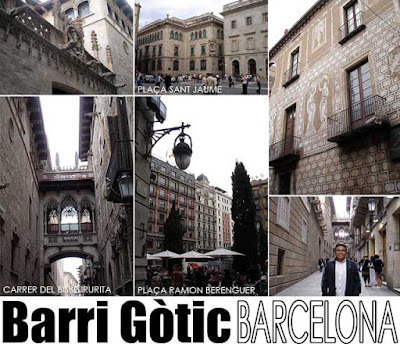 After exploring La Rambla, I went deeper into Barri Gòtic, Barcelona's Old Quarter. The district stretches from La Rambla to Via Laietana, and from the Mediterranean seafront to Ronda de Sant Pere. Don't miss the many fabled structures including the covered Gothic walkway above Carrer del Bisbe Irurita, the Cathedral of Santa Eulalia where her remains are buried in a magnificent crypt, and Placa Sant Jaume where the Casa de la Ciutat (Ayuntamiento) and Palau de la Generalitat are located. In the Cathedral, you'll notice thirteen geese in the central courtyard of the cloister. The number represents the age of Santa Eulalia when she was martyred in the 4th century. Magnificent chapels are scattered around the cathedral. 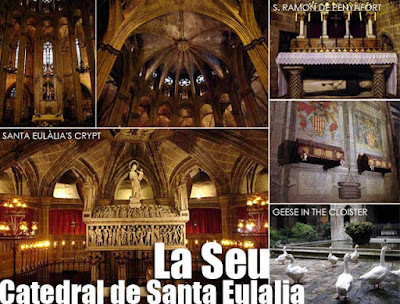 Aside from Santa Eulalia, another popular saint buried in the Barcelona Cathedral is St. Raymond of Penyafort. It would be best to get a free map and suggested walking routes from any tourism office or kiosk conveniently located around the area in order to maximize your trip to Barcelona. The brochures I got were a big help. Yes, they can be covered if you take the Barcelona Bus Turistic. A day pass is 20 euros while two days is 26 euros. It's very much worth it since it stops within meters of every major tourist attraction and thus saves a lot of time from walking. Ivan!!! So how's Barcelona? I gave Pat a list of sites to go to =) hope it's useful... So how's everything? Who's staying with you sa host family mo? Did the host family assignments change?? Hope all is well.. Miss you guys!